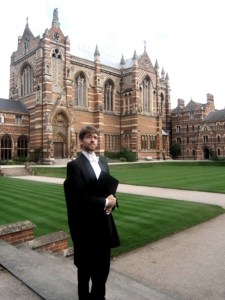 Rhodes Scholar Brian Krohn ’08 was selected to pursue a Master’s degree at the University of Oxford in environmental change and management. 1) They provide significant financial support. National scholarships and fellowships vary in purpose, but they all provide financial support for some form of educational experience. The scholarships and fellowships included in our directory provide funding for undergraduate tuition, graduate tuition, graduate school living expenses, and study abroad experiences. Most national awards exceed a $5,000 value. 2) They are prestigious. Winning a national fellowship or scholarship competition indicates to graduate schools and employers that you are an elite candidate. Some scholarships include a conference at which you meet fellow scholars from around the country, while others provide access to a network of previous winners. These networks can open doors to exciting and unique career or academic opportunities. 3) You will build skills that will make you a stronger graduate school or job candidate. When applying to a national scholarship, you will learn how to write a compelling story about yourself and your accomplishments. These personal statements are very similar to those you will write when applying to graduate school or a cover letter. This style of writing is different from other styles and takes time to master; a national scholarship competition is the perfect opportunity to develop and hone this valuable skill. You may also have the opportunity to develop your professional interviewing skills with a campus or national selection committee as some competitions require these. In these guided workshops, participants work on centralized applications to health professional programs, personal statements, and secondary applications Participants of Application Bootcamp will receive priority application assistance from URGO. Spots are limited to Augsburg students and alumni.